I love a good fireplace. If you are a member of the always-cold club, you know what I’m talking about. Sitting in front of a roaring fire is my idea of cozy. 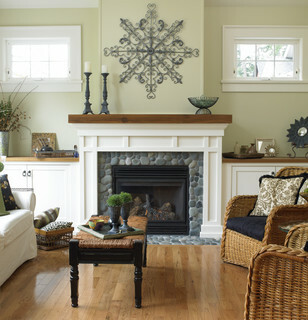 Whether you love the smell and crackle of a wood-burning fireplace or the ease of a gas-burning one, choosing the right facing is a big decision. Slab. A slab of marble, granite or another solid surface creates a dramatic and minimalist aesthetic. Make sure to hand select your slab and discuss the best area to cut with your installer. Try to take advantage of veining that creates a focal point. Cost: Around $7,000 to $10,000 for the slab, fabrication and installation. This facing is among the higher-priced ones. Steel. Most areas require a specified width of a noncombustible material for a fireplace surround and hearth. (Check your local codes for details.) A steel facing certainly fits that requirement. A custom application that feels rustic and modern, steel is a great look. Cost: From $5,000 to $8,000 for raw materials, custom fabrication and installation. Copper. 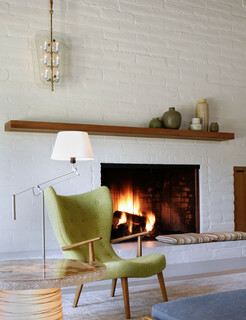 I love copper in almost any application, but I think it’s especially slick on a fireplace. One of my favorite attributes of copper is the way its finish changes over time. 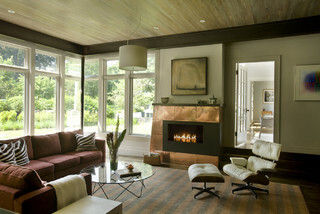 Copper is not only a beautiful facing choice, but a conversation piece in any room. Cost: $5,000 to $8,000 for materials, fabrication and installation. Stone. 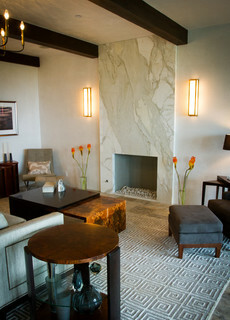 There are many options of stone to choose from for a fireplace facing. I love to wander at stone yards looking at all the different varieties. Stones such as fieldstone come in many shapes, colors and textures. I suggest finding the best installer you can and work with him or her to select the best stone for your fireplace. Cost: Around $4,000 to $7,000 for stone and installation. Painted brick. An option I have used often, painted brick works every time. If you are longing to update your old red brick but are short on budget, paint your brick. Any color can work, but white works with so many different styles. 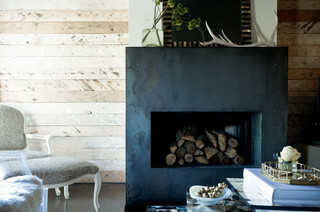 Modern, rustic and coastal all work with a painted fireplace. Classic brick. This is timeless and inexpensive compared to other hard surfaces and makes itself at home in traditional and transitional styles. Bricks can be installed in a staggered pattern or stacked for an even more contemporary look. Cost: Around $2,000 to $5,000. River rock. A naturally round stone that comes in various palettes, river rock is available in many sizes, even up to 15 inches. River rock is textural and neutral and fits with traditional and rustic styles. Cost: $4,000 to $7,000 for materials and installation. Finished steel. This example shown here is described as having a blued finish. This is not paint but an actual finish process. It’s a great-looking detail for a modern or transitional space. Cost: $5,000 to $8,000 for raw materials, custom fabrication, finishing and installation. Poured-in-place concrete. 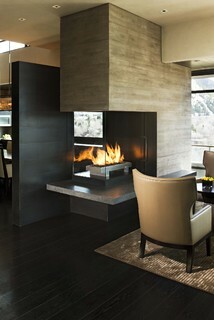 Another great selection for a modern style, this concrete fireplace was poured in place. It’s a great-looking choice, but definitely one for a specialist to install. Ask your contractor about concrete specialists who can provide examples and pricing for your consideration. Cost: $7,000 to $10,000 for raw materials, custom fabrication and installation. Ledgestone. This is the texture lover’s choice. It’s available in many colors and can be installed horizontally, or vertically for a more modern look. Notice here how the ledgestone above has been mixed with a slab on the bottom. Prefabricated travertine or limestone. 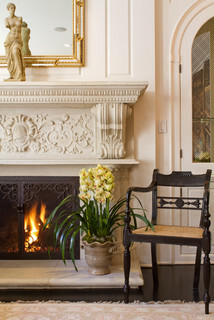 For a very traditional look, consider a prefabricated fireplace of travertine or limestone. This look requires a mason experienced with framing as well as installation. Heavier pieces may need to be reinforced. Cost: $7,000 to $10,000 for prefabricated pieces, shipping (which can be high due to weight and crating) and installation. Ceramic and glass tiles. 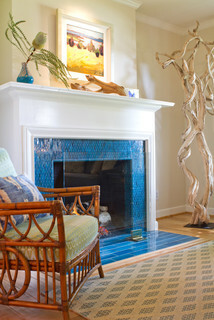 Individual ceramic or glass tiles are a definite win on any fireplace surround. They’re available in many colors and shapes, so the design options are endless. Cost: Can vary greatly; around $2,000 to $5,000 for tile and professional installation.